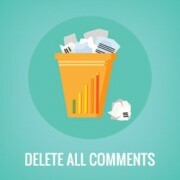 Do you want to delete all comments from your WordPress site? It is rare, but on some occasions a site owner may decide to delete all the comments from their WordPress site. 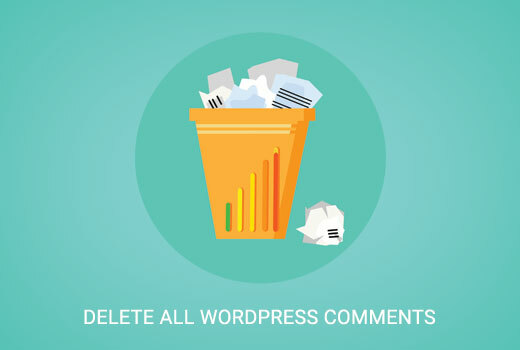 In this article, we will show you how to easily bulk delete all WordPress comments. There are many legitimate scenarios when a user really needs to delete all WordPress comments without any hesitation. For example, you filled WordPress with dummy comments on a development site just to see how they would look. You would want to delete those comments before moving to a live site. There are many other scenarios as well, where a site owner would want to get rid of the comments from their WordPress site. However, if you just want to delete the spam comments, then take a look at our guide on how to batch delete spam comments in WordPress. If you are upset about comment spam on your WordPress, then make sure you check these tips and tools to combat comment spam in WordPress. If there are comments showing up on your pages, then take a look at how to disable comments on pages in WordPress. If none of the above scenarios apply, then continue reading. First you need to create a complete WordPress backup of your site. Deleting all comments in WordPress is an irreversible action. You will not be able to undo it once you have deleted those comments. This is why it is important that you have a backup. First thing you need to do is install and activate the Delete All Comments plugin. For more details, see our step by step guide on how to install a WordPress plugin. Upon activation, you need to visit Tools » Delete All Comments page. This is where you will see the total number of comments on your website, a confirmation box, and the delete button. Clicking the delete all button will permanently delete all comments from your WordPress site. Including those in spam and trash. You can now visit the comments page, and you will see all comments safely deleted from your WordPress site. You can also quickly delete all WordPress comments using MySQL or phpMyAdmin. This method is only recommended for more advanced users. Login to cPanel dashboard of your WordPress hosting account. Under the database section, click on phpMyAdmin. Inside phpMyAdmin, you will need to locate your WordPress database. You will see a page like this showing all your WordPress database tables. Check the box next to wpprefix_comments and wpprefix_commentmeta table. The name of your comments tables may differ depending on the table prefix you choose during your WordPress installation. 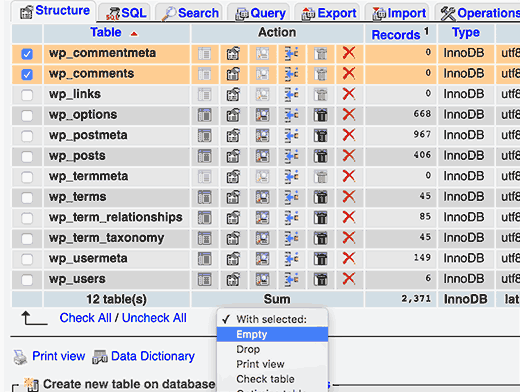 After selecting comments table, locate the ‘With selected:’ drop down menu below the table list and select ‘Empty’ from the drop down menu. PhpMyAdmin will now show you a warning asking if you really want to empty those tables. When using phpmyadmin then you need to delete also wp_option called “_transient_wc_count_comments” so admin comment count will be reseted. Thanks Buddy, Such a cool trick to delete comments. It worked out for me. This one is cool trick. I’m wondering, is it possible to do some cool task in self hosted WordPress using Bookmarklet?